It should be a thing that any band boasting the name “Deltas” in it will be good. Catching this act in 2014, I was sold on Jessica Hernandez’s gothic take on soul. This band is moving, gripping and addictively dark. The new album, Telephone/Teléfono, takes the familiar style of Secret Evil, but in a noticeably-pop driven direction. Telephone/Teléfono shows off Hernandez’s ability to be personal and provocative. In this record, Hernandez goes a step further by diving straight into her Cuban and Mexican-American heritage. To represent this, Hernandez recorded two versions of her sophomore album—one in English and the other in Spanish. Both the English and Spanish recordings display a unique and fresh take on the listening experience. It’s pop for everyone, and this record represents the potential of music’s inclusive vitality. 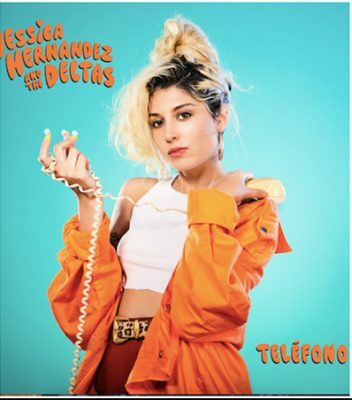 Plus, like Jessica Hernandez & The Deltas’ other material, Telephone/Teléfono still has an eclectic range of styles. It’s psychedelia surf with Latin roots, plus a definitive, punky edge—not to mention plenty of the renowned Detroit nitty-gritty. Telephone/Teléfono has its share of top numbers. For me, “Oh No”—both the English and Spanish version—is at the top of this list. It’s groovy and fuzzed-out. It’s a catchy tune about being unable to truly forgive and forget. “Hot Damn” is another favorite. Sung in the first person, it’s about someone checking out a crush. Eerily wild and untamed, this track captures an adrenaline filled anxiousness about falling for that special someone. Bouncy and Sultry, “Hummingbird” invokes a kind of Tom Waits sound. Of all the tracks on this record, “Hummingbird” captures Hernandez’s flirtations with a poppy gothic essence. “Hot To Trot” makes obvious nods to Riot grrrl angst and punky deviancy. It’s jumpy and energetic with plenty of whoa-oh-oh-ohs. This is the kind of track to get up and going to for a night of delicious and dangerous adventure. “Fire & Ice” is kind of jazzy, hearkening to Amy Winehouse’s style with a little Nina Simone. In this track, the piano is prominent. Coupled with Hernandez’s impressive vocal range, this songs drives a cool and collected feeling to the theme of the complexity of loveless confusion.